In the news today, it is common to hear about forest fires ripping through the midwestern and western states, but you rarely hear similar stories from the eastern side of the country. While the Adirondack Park has seen its fair share of devestating fires, their frequency and scale have been minimal in recent memory. This can largely be attributed to measures that were put in place in the early 1900s after the region was threatened by some seriously destructive blazes. Two "great fires" in 1903 and 1908 charred almost 1 million acres of Adirondack forest. They were the worst in a long line of conflagrations that broke out during the late 19th and early 20th centuries, and they caused New York State to re-think its fire prevention and containment strategies. In response, New York established fire districts complete with superintendents and patrolmen whose job it was to detect fires early and extinguish them efficiently. To simplify the detection process, fire towers were built on the top of mountains, which allowed trained observers to pinpoint the location of fires in the distance and alert those on the ground. The first fire tower was erected in 1909 atop Mount Morris. It was constructed from logs, and similar towers went up on the summits of Gore, Hamilton, Whiteface, West, and Snowy that same year. As more towers were built, observation stations were also constructed, with the first being built on Poke-O-Moonshine in 1912. These enclosed and covered spaces atop the towers provided observers with more protection from the elements while they scoured the horizon line for smoke. Steel towers replaced the log structures in 1916, and were typically built between 40 and 70 feet tall. The observation stations contained a circular map of the Adirondacks and a pointer tool that enabled the observer to identify exactly where smoke was coming from. The stations also contained a telephone with which the observer would call to alert fire departments. In addition to the towers, New York State also established a full-time brigade of Forest Rangers and Fire Observers who became integral pieces to the fire prevention and detection puzzle. More than 120 fire towers were erected throughout New York State, with 57 of those standing within the Blue Line. The system worked wonderfully until the 1970s when use of aircraft to spot fires became more desirable and more cost effective than maintaining and manning the towers. Staffing of the towers gradually decreased, and by 1990, none of those in the Adirondacks were actively used anymore. Some of the towers were torn down, while others stayed in place, but became rusted and unstable. 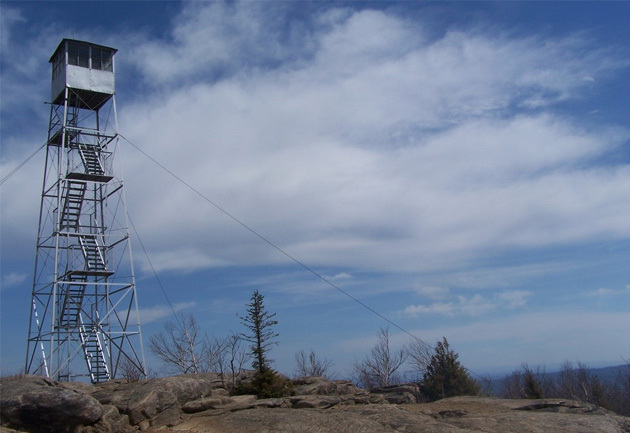 Hikers have been attracted to the fire towers over the years, and a hiking challenge was even established to encourage hikers to summit at least 18 of the fire tower peaks in the Adirondacks and 5 in the Catskills. Of the 57 original steel Adirondack towers, 34 are still standing today. Groups that appreciate the historic significance of and breathtaking views from the towers have been working to restore the structures and make them safe and accessible to the public. Some of the peaks that have restored towers include Blue, Goodnow, Poke-O-Moonshine, Hadley, Kane, Snowy, and Mt. Arab. In 2016, the Stillwater Fire Tower in the western Adirondacks was restored, along with a trail leading to the tower. Visitors are able to see amazing views of the High Peaks, Tug Hill, and Five Ponds Wilderness. Potential visitors should note that Stillwater Fire Tower is closed from October 11 through December 20 because of hunting season. The tower is on leased hunting club property, so hikers should not attempt to reach the tower during this time. Other restorations are in progress, but the future of un-restored towers at this time appears to be grim.